This is a recording from the IWW Southern Speaking Tour event which took place in Houston, TX, earlier this summer. 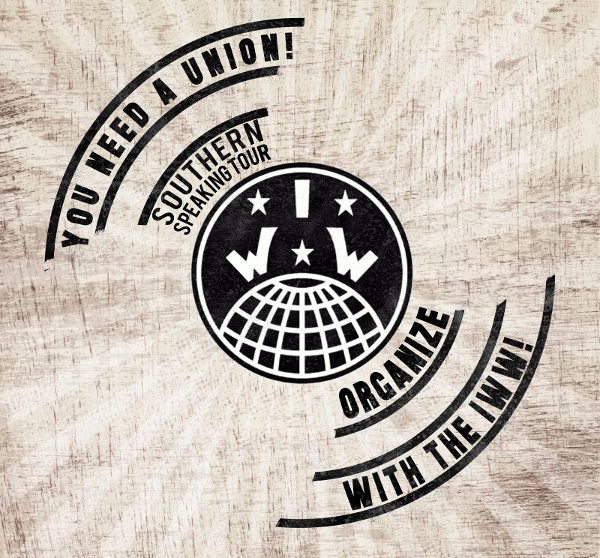 The IWW Southern Speaking Tour saw events in 13 different Southern Cities and was probably the largest coordinated IWW activity across the South since the 1930s. We hope that it’s just the prelude to much more. Many thanks to the comrades and fellow workers at Subversive Skype who recorded and originally posted it online. The Houston Industrial Workers of the World (IWW) and Incarcerated Workers Organizing Committee (IWOC) is hosting Wobs from the African People’s Caucus and from Atlanta Georgia speak on the IWW work for the Southern Speaking Tour! Come join us as Dee from the APC talks about their work in Minneapolis organizing in the Black Lives Matter movement. Brandon from Atlanta will be discussing recent workers struggles in the US. And Houston folks discuss their work doing immigrant rights work and incarcerated workers organizing work. Posted in IWW, Revolutionary Unionism, The South, USA. Previous Post Revisiting the Five Year Plan – can we do it in four?